Collectible porcelain Christmas ornament by Enesco from their Designed Giftware line. 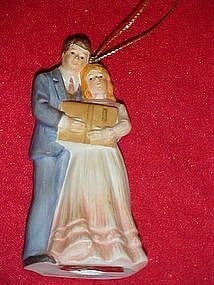 On the bottom it has "Our first Christmas together" and is dated 1986.A couple stands together and shares a bible or songbook. Hand painted bisque porcelain and measures 3 3/4" tall and has the original gold hang string. Original gold foil Enesco sticker too. Perfect condition. #600385.